Film Review: ‘The Lone Ranger’!! Director Gore Verbinsky certainly borrows heavily from his animated Western, ‘Rango‘, along with some other choice films for his latest mega budget action adventure film ‘The Lone Ranger‘. In what seems to be a project greenlit only for the fact that Johnny Depp was willing to get in makeup and costume again and sport a new iconic character, this remake is deeply flawed and way too long. Running at two-and-a-half hours, this adventure flick could have been loads better with a full hour knocked off its run-time. In addition to its long run-time, ‘The Lone Ranger‘ never realizes what type of movie it wants to be. It goes from over-the-top silly comedy to a brutal western, to an action adventure all too often and never mixes well. The film stumbles all over the place tone-wise and never seems to keep an even pace. I know Verbinsky, Depp, and producer Jerry Bruckheimer are going for another ‘Pirates of the Caribbean‘ type of franchise that will make billions of dollars, but despite its moments of thrilling entertainment, this film might not make enough to greenlight several more sequels. We’ve all seen or heard in some form or fashion about the Lone Ranger, his Indian partner Tanto, and his majestic horse, Silver. There were almost 3,000 radio shows depicting the masked vigilante, an eight-year long tv series, and a couple of films that came before this $200 million project. The ‘Pirates of the Caribbean‘ writing team came back for this Western and started the film out in 1933 San Francisco, where we see a young boy dressed as a cowboy, complete with eye mask, enter a carnival overlooking the “in progress” Golden Gate Bridge’. He immediately enters the Wild Wild West tent and looks at the stuffed buffalos and giant bears that once ruled the west. He ends up looking at a diorama titled “Noble Savage”, which depicts a very old Comanche Indian with a dead black bird on his head. Take a closer look, and we see it is a very heavily makeup’d Depp, who for some reason comes alive to talk with the boy about his past, which sets the scene for out story as we flash back to 1869 where a younger Tanto first met John Reid. I’m not sure why Verbinsky and his writers decided to tell the story this way, but there is no reason or tone set for the geriatric Tanto to tell this story. It’s never mentioned or hinted as to why he suddenly comes alive and spills his guts to a complete kid stranger. That aside, we first meet the District Attorney prosecutor John Reid (Armie Hammer) in a train full of church goers and in a separate car, the evil outlaw Butch Cavendish (William Fichtner), who Reid is taking into town for justice. Sitting next to Cavendish is Tonto, but when Cavendish’s band of outlaws show up and destroy the train and free their gang boss, Reid and Tonto finally meet. Now in Colby, Texas, John is reunited with his Texas Ranger brother Dan (James Badge Dale) and his wife Rebeccca (Ruth Wilson), and the railroad owner Latham Cole (Tom Wilkinson), who has taken a liking to the Reid family. Cole insists that Dan and his team of deputies head out and track Cavendish and his outlaws down and bring them back to town for a hanging. But when all of them are gunned down by Cavendish and his men, all seems lost as Tonto beings to bury the dead lawmen, until John wakes up. Finally, after an hour into the film, John puts on the black mask, the white hat, and meets his horse, and Tonto, and John team up and start their adventure. The next hour is chock full of scenarios seen in the tv series and heard on the radio show including Tanto’s origin story of how he was kicked out of his tribe, an evil scheme by Cavendish to steal Silver and build more railways, and a battle between the evil white men and the Indians, which shadowed a climactic scene in one of the ‘Lord of the Rings’ films. This all leads up to the last half hour of the film, which is by far the best part and the best action sequence in movie. And it’s the time where we finally hear the famous William Tell Overture. But by then, we are worn out and ready to go home. One thing I really liked was that Verbinsky spent a big chunk of the budget on building over six miles of actual train track and two actual trains to use while filming, instead of going the CGI route. The results are amazing and the film itself looks incredible. 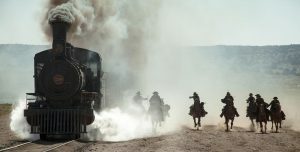 We haven’t had a decent train adventure film in a long time, and ‘Lone Ranger’ remedies that for train enthusiasts. Depp is amazing in this role as Tanto, but when is he not amazing in anything he does? He gives a great performance that is at times very dramatic as well as subtly comedic, and we never know what angle he is coming from. He’s a true genius. Armie Hammer as ‘The Lone Ranger’ isn’t what I wanted it to be. I love Hammer’s work, but here, while he pulls of the straight-laced professional guy, he doesn’t quite command the hero role so well, and the character gets lost in the other elements of the film. Fichtner pulls of the evil villain very well and is quite disgusting to look at through the entire film. Wilkinson turns in a solid performance as well with a brilliant cameo by Stephen Root. And of course, this having Johnny Depp in the film, Helena Bonham Carter shows up with a shot-gun peg leg, playing a prostitute. ‘The Lone Ranger‘ is an average movie at best and suffers from what type of genre it ultimately wants to be. You can’t have a brutal battle where thousands of Indians are slaughtered, and cut to a joke about a horse and killer rabbits. It doesn’t work and it throws the audience off and out of the dramatic moment. If you love Depp and don’t mind sitting through a two-and-a-half hour film that jumps around all over the place, then see this movie. If not, then you might want to wait till video. On an end note, the kill count in this Disney film might be larger than all of the Rambo films combined. This entry was posted on Tuesday, July 2nd, 2013 at 5:55 pm	and is filed under Film, News. You can follow any responses to this entry through the RSS 2.0 feed. You can skip to the end and leave a response. Pinging is currently not allowed. Good call on Depp’s genius. While the chemistry lacked between the leads is was fun from time to time. Part of what made Johnny so memorable was the, as you put it, spontaneity to his lines and delivery. Eh perhaps this will be more fun on Blu Ray…but still a 150 minute movie is tough to swallow if it’s as slow and sluggish as The Lone Ranger. You taking the jet-pack out today? « Film Review: ‘Despicable Me 2’!!! I know practically every position. We all know your favourite positions, Rita.